Uber the unfair? 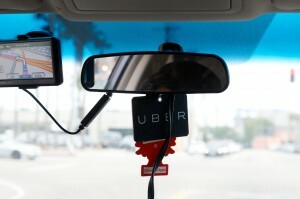 Are ride-sharing firms exploiting deregulation? Editor’s Note: Watch Making Sen$e’s broadcast segment on the ride-sharing economy at the bottom of this post. Listen to millennials talk about “Ubering” to a party or the office, and it’s no secret that Uber, Lyft and even Sidecar, mobile ride-sharing apps, are giving traditional taxi companies a run for their money. Hansu Kim is a longtime tech consultant who has helped bring new technologies, like a back-seat camera, for example, to cabs. A couple of years ago, Kim bought San Francisco’s third largest taxi cab company, DeSoto. And right away, the new high-tech competition hit close to home. 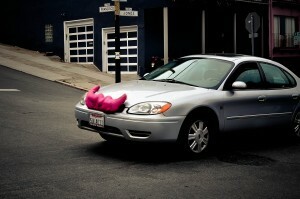 His San Francisco neighbor began sporting a pink moustache on his station wagon. That is, he began driving his personal car for the ridesharing service Lyft (and literally affixed a pink moustache on the grill to signal that he was a Lyft driver). Photo by Flickr user Spiros Vathis. “He likes the idea of being able to drive his own car whenever he wants and not having anyone regulate him. He can just make money as he sees fit,” Kim told Paul Solman. But this neighbor, Kim said, had never taken a taxi driving class, had a background check or received a taxi license. “And that, to me, is the loophole here,” Kim said. Objectively speaking, Kim gets it: the taxi industry needs to deliver a better service more efficiently. In fact, he thinks the taxi industry’s inability to meet public demand in San Francisco allowed Uber and Lyft to grab a big chunk of the market. Kim understands the appeal of ride-sharing technology. His own company, like much of the taxi industry in San Francisco now, has adapted technology, through a platform called Flywheel, that allows riders to order cabs from their phones and rate licensed taxi drivers, emphasis on the licensed. From a purely profit standpoint, Kim admitted that he too would run a more profitable business without those regulations. But that wouldn’t serve the public interest, he insisted. “Taxi cabs,” he said, “are really a public/private partnership with the city,” especially since some cities require taxis to equip some of their vehicles for handicapped “paratransit service,” for example, which Uber and Lyft are not required to provide. In San Francisco alone, he estimated, there are more than 30 million individual taxi rides in a year. “Given [that] number of rides, and San Francisco being such a popular destination city, there are very few problems between passengers and drivers.” That speaks volumes for passenger safety, he said. Plus, Kim added, unlike personal vehicles used for ride-sharing (he was appalled to see a dented 1985 Mazda picking up riders), 90 to 95 percent of San Francisco’s taxi cabs run on clean-burning fuels — another benefit for the public. For all of these reasons, Kim argued, regulation is a public good. And yet, the taxi industry has had trouble meeting demand. That’s gotten them into trouble, especially now that San Francisco’s 2,000 taxis are outnumbered by the roughly 7,000 drivers, he estimated, who now use their own cars like taxis. That’s a whole lot of drivers who don’t have to pay the costs Kim does. Taxi drivers pay a small fortune to buy the limited number of permits, or medallions, issued by city regulators that are required to drive a cab. Cab driver Muaffaq Mustafa was lucky to get his for only $125,000, half the usual price. He’s been paying it off, but still owes $119,000. “Why would you go invest $125,000 in a medallion that permits me to pick up people when the same person right next to me doesn’t have to pay that,” he said. Could Brooklyn hipsters help save the middle class? Paul Solman: If each medallion sells for $250,000, why wouldn’t the city create more, and then get more money? The city is sitting on, perhaps, a couple of hundred million dollars’ worth of medallions with the ability to create more. Hansu Kim: It’s quite astonishing. You would think that the City would realize that by deregulating the industry they’re only going to lower the value of the medallion, when in fact if they made sure that people who don’t have a license are not servicing the City, they could actually sell a lot more medallions and make an enormous amount of money. Paul Solman: So then the simple economics question is, why is the city doing something that’s against its own interests? Hansu Kim: It’s a great question. The city could make hundreds of millions of dollars by selling medallions and instead they’re letting the industry deregulate, devaluing the medallion. … My feeling is that the companies that are now popping up that have enormous venture capital behind them based here in San Francisco are also large contributors to the powers that be in the city. These companies have smartly framed what they’re doing as innovative technology that would only be stunted with regulation, when in fact, the story really here is about deregulation. Meanwhile, suppose you’re one of those San Francisco drivers, who staked their future on buying one of the scarce medallions? A driver like Mustafa. I feel like I’ve just been betrayed, you know. I’ve been a driver for 20 years. I gave up half my life for this industry. Since the minute I got into this industry I feel like they asked me to follow the rules and regulations to move from one step to another step, from one step to the higher step and I follow these rules. And finally when I felt like I’d got up there in age and I felt like it’s time for me to get my medallion, have my own business, all of a sudden all these people who’ve never been in this business, not regulated, they’re not playing by the same rules and regulations that I played for the whole 20 years, they’re sharing my income. All of a sudden, these people are sharing the road with me. So owners and drivers, as we point out on air on the NewsHour Thursday night, hate Uber and its ilk. But when you ask economists, perhaps unsurprisingly, they like the idea of increased competition in the ride business. According, to a poll of 40 economists released this week from the IGM Forum at the University of Chicago’s Booth School of Business, all thought that more competition would boost consumer welfare. (“Try calling for a cab on Saturday night from the south side of Chicago and see what happens,” said Chicago’s Austan Goolsbee, President Obama’s former top economic adviser.) But the survey question had built in an assumption: that ride-sharing apps would “compete on equal footing regarding genuine safety and insurance requirements.” And that’s where Kim puts his emphasis. Learn more about that competition and hear from Hansu Kim in Paul Solman’s report on ride-sharing. Left: Uber may be a great service, says DeSoto Cab owner Hansu Kim, but only if it's regulated. Photo by Flickr user joakim.